“It requires us to first contend with ‘El Barrio’s’ identity. While Puerto Ricans were instrumental in the foundation of the museum, it is not strictly a Puerto Rican museum. It is a museo ‘del Barrio.’ Further, demographic changes in East Harlem and the overall growth of the Latinx diaspora in the last 50 years render the nationalist led push to make El Barrio mean “Puerto Rican” null. If El Museo is to be resuscitated, we must lay these claims to rest and set about addressing who we mean when we say El Barrio. If El Barrio means neighborhood, or enclave, and we are defining the institution as encompassing a diasporic latinidad, then what we are contending with is what is now being called ‘Latinx.’ Loosely defined, this is the Nuyorican, the Dominiyorker, the first, second, and third generations of Mexicans, Colombians, Ecuadorians, and Hondurans that make up a barrio in the Bronx, Queens, Brooklyn, and New Jersey. It is the El Salvadorian and Guatemalteco kids in Silver Springs, Maryland, the Cubans in New Jersey, the Tejanos, the Chicanos. It is the dreamers and the migrants who identify with a U.S. lived experience. It is the children of immigrants at the border and the children of recently arrived Puerto Ricans in Orlando and Pennsylvania Post- Maria, that have and will grow up here. The signatories of the letter are asking for El Museo del Barrio to fulfill its original mission: to serve as a resource to the Latinx community (providing community-focused programming and opportunities for young Latinx artists and curators to grow their careers), to represent and celebrate Latinx culture and art, and to be an accessible, community-centered space, not another elitist art institution. Marabou thinks it is important to highlight that community members, artists, activists, and scholars are usually the ones who speak up and demand for a museum to change its unjust ways, or to readjust if it’s going off-course. Change can and has happened when the people challenge museums. For example, look at the success of the Sackler Pain campaign, led by artist Nan Goldin, resulting in a number of major institutions announcing they will not accept Sackler family money moving forward. Pressure on the American Museum of Natural History by Decolonize This Place and their collaborators over three years has prompted the museum to respond by explaining the cultural inaccuracies in one of its dioramas. Holding museums accountable is possible, we just need to continue advocating until we are heard and see the changes we want. 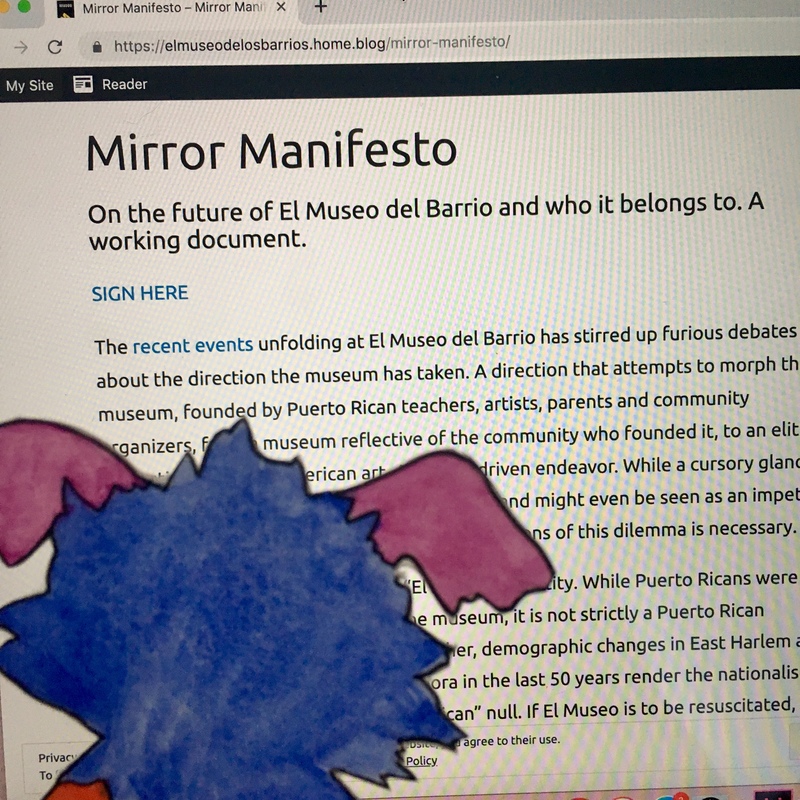 Marabou supports the signers of the Mirror Manifesto and the work they are doing to return El Museo del Barrio to its mission in service of its community.